PIC-MCP is low cost alternative of PicStar+. It's MPLAB compatible and MPLAB recognize PIC-MCP as Picstart+. To operate it needs external power supply 18VDC. PIC-MCP have gold plated 40 pin ZIF socket which accepts all types of DIP PIC microcontrollers. 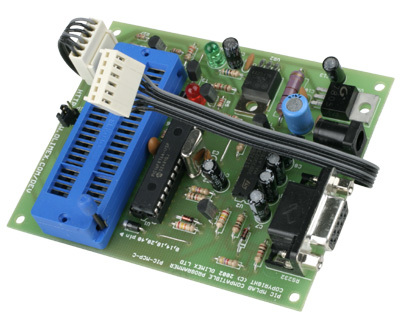 In addition it have ICSP connector and can be used to program all PIC-PxxB prototype boards.